There are some men who are dreary because they do not believe in God; but there are many others who are dreary because they do not believe in the devil… The full value of this life can only be got by fighting; the violent take it by storm. And if we have accepted everything we have missed something — war. This life of ours is a very enjoyable fight, but a very miserable truce. I stumbled, or re-stumbled upon this quote just after a conversation with someone about fear and the Christian life. While there are a number of things we should not fear as Christians, we should be terrified of something that will lead us away from living fully in Christ. Complacency should be one of those things. Of all the vices, the early Christian fathers most warned about acedia, better today known as sloth. It is not just laziness, but a “a state of restlessness and inability either to work or to pray” according to Aquinas. As I write this, spell check does not even recognize the word. I once worked in an office environment where there was an acknowledgement of the afternoon slowdown, referred to as a being “food stupid.” Full bellies, a lull in the day, and the highly contagious attitude of acedia made the hours after lunch seem to drag out. The desert fathers, however, had a more solemn name for this apathetic nature: the noonday demon. Yes, a demon. Acedia was considered a very dangerous mindset not only of laziness or sadness, but of apathy. Sluggishness, watching the clock (in its most ancient form, the sun), anxious fretting, idle conversation, procrastination, and a desire to nap. Sounds like a typical office afternoon, though Cassian’s account lists serious signs of a demonic influenced disease. His description goes on to describe the afflicted monk being affable and hospitable, making visits to this person or that, while neglecting his calling. This is, I can speak from experience, a miserable state to find yourself. While generally agreeable, somewhat peaceful, it is an anxious restlessness, and sometimes a feeling of uselessness – or that nothing can really be accomplished right now anyway. To put it otherwise, the “miserable truce” to which Chesterton refers in the opening paragraph. Suddenly, this seems like a rampant problem among Christians today. A passive contentment that seems to grip us. We are not idle, but we shirk some more serious work to busy ourselves with being pleasant or killing time. Killing time – as if we had any to spare! We are called, as Christians, to be soldiers, to be servants, and to go forth and proclaim the Gospel. If we idle away the hours waiting for the end of the workday, the day, the week, the month, we are eventually losing that precious and too short life on this earth. How will we give an account for those hours spent in an acedic state? Peacetime is a scourge to soldiers and armies. Those highly reputed masters of the sword, the samurai, recognized this and thus maintained regular practice and a desire to perfect their martial craft. The Art of Manliness cited the activities of a sword master who would practice slicing raindrops as a way of practicing zanshin, or an ever-readiness for battle. This even extended, as the article discusses, how the samurai would use the toilet. To a samurai, life was all about being ready for battle. Life was a fight. Acedia or sluggishness got you killed, or cut off from your employer. As Christians, we should fear what the demon of acedia can do to our soul if we do not vigilantly watch for it and occupy ourselves with the work we are given. If you find yourself experiencing life as a “miserable truce,” remind yourself that we are engaged in an ongoing spiritual battle “against the rulers, against the authorities, against the powers of this dark world and against the spiritual forces of evil in the heavenly realms.” Train yourself daily – not necessarily by slicing raindrops with your sword, but by constant and regular prayer, charitable acts, and doing your duty in each and every moment to your Lord, your family, and your employer. That is why we have been warned not to conform to the world as it is, or to put it in military terms, to declare a truce with the world. Life gets a lot more enjoyable when you realize it is a battle. 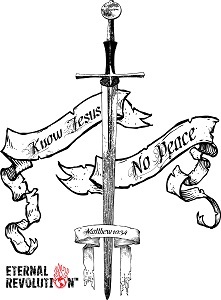 Get the sword image pictured here as a shirt! Paul Nowak is a husband and father of 7, who also happens to be a writer and author. He has written The Way of the Christian Samurai among other books. Get a FREE ebook copy of The Eternal Revolution when you sign up!